Bethany Tabaka attended Chelsea Public schools through high school, then majored in both elementary education and Spanish at Western Michigan University. She learned to speak Spanish fluently by participating in a study abroad course in Queretero, Mexico. After college, she married Josh Tabaka (“the love of my life!”) and started teaching as a Spanish teacher in Jackson. Tabaka taught there for one year before she was hired by AAPS as a part time Spanish teacher at Pittsfield Elementary and a part time Title 1 math teacher at Carpenter. 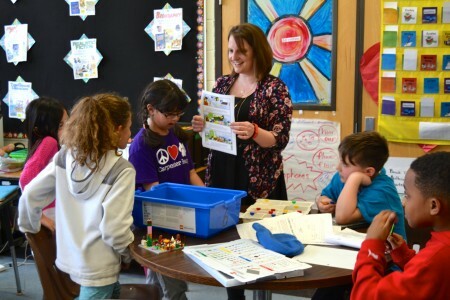 She eventually moved into the classroom full time at Carpenter Elementary, where she has been teaching third grade for the past five years. She and her husband live in Chelsea with their children, Abby, 2, and two-month-old twins, Alex and Andrea. Describe an average workday. My work day starts out very early. I am up by 5 so I can get ready for the day, packed up and out the door by 6:30. I like to go to the gym to get a good run in before I go into my classroom. I plan my day out in my head while I run and then finish prepping for the day when I get to my room. I set up my classroom, check my technology to make sure it is working for the day, and get ready for the bell to ring. As soon as that bell rings, I hit the ground running and almost never sit down until it is time for dismissal. What’s the most important thing you’ve learned about teaching? About learning? OVER PLAN OVER PLAN OVER PLAN. You can never be too prepared for teaching. If you over plan, then you will be ready for almost any situation. It is a good thing to have too much and not get to it than to not have enough and too much time. Which apps and websites would you recommend to other teachers? How do you stay organized? Organization was always a difficult thing for me, but I know how important it is in order to function in a classroom. I had a colleague of mine, Rebecca Archer, come into my room and help me get organized when I moved into my classroom. She helped me come up with a place for everything so everything would be in it’s place. I mostly work off of a bin system where every subject has a bin so I know where to put things and where I can find them as well. What was your own experience like in third grade? I had a wonderful third grade teacher, Mrs. Plank. She was very kind and patient with me. I was not exactly the best reader or writer and she helped me to enjoy both of those. I remember being student of the week where I received a special letter from each student in the class (which I do with my third graders to this very day). I loved third grade. Who inspires you, and why? My family has always been my inspiration in everything that I do. My parents have always instilled the values of pride, hard work, determination, and dedication to anything that I set my mind to. My sister has overcome a lot in her life and I have been amazed at how she always has a positive outlook, no matter what life throws her way. My husband has always been there by my side and inspires me to be the best that I can be. Finally, my children have become the newest source of my inspiration. I want to set a good example for them on how to live life to the fullest so I can inspire them in life. Where do you picture yourself in five years? 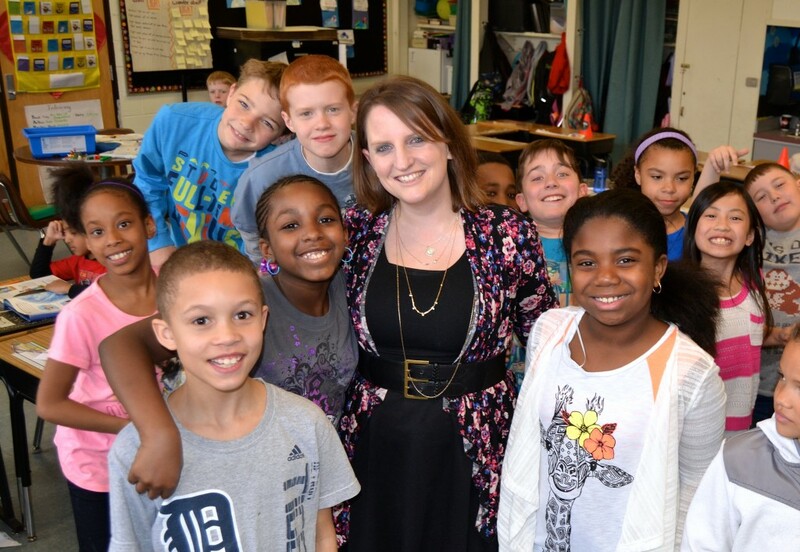 Since being a teacher in Ann Arbor has always been my dream job (no joke here), I see myself still being a teacher in Ann Arbor and working with students in grades 3, 4, or 5.
Who was your favorite teacher, and why? While I did have many amazing teachers in my life that helped to shape me into the person and teacher that I am today, the one that stands out the most is Mrs. Caselli. She was my sixth grade language arts teacher who taught me more than just reading, writing, and grammar. She taught me one of the most important lessons of all: She taught me to be me and that it is OK to be different and be proud of the person that I am. I was in multiple drama plays of hers throughout middle school and I still keep in touch with her to this day. She went above and beyond her job as a sixth grade language arts teacher. In fact, I would call her a “mentor on life”. She has played an essential role in making me the person and teacher that I am today. What has surprised you most about the profession? How something that seems so small to me just might be a huge event in a students life. It helps me not take the small things for granted. What do you wish everyone realized about the work of a teacher? A teacher’s work is never done—even in the summer. Your teacher brain is constantly turned on finding new ideas for your classroom, be it in instruction, classroom set up, or the latest and greatest technology to implement to enhance instruction. If you could change one thing about public education, what would it be? Helping to change the playing field for all schools because “fair” does not always mean “equal”. What would you tell a college student considering becoming a teacher? Get into a classroom—or as many different classrooms in a variety of different demographics as you can. You will learn the most by getting into the field and seeing an array of teachers and students in action. Sure you will learn a lot in your college courses, but being in the classroom will prepare you even more for when you get your very own class. What do you like to do when you’re not working? When I am not working, I love spending time with my family, being outdoors, or doing something creative such as photography, painting, crocheting, or making jewelry. How do you manage a full-time job and three children ages 2 and under? Working a full time job and having three kids two and under isn’t easy at all. I am only able to do it and have a sound mind because I am surrounded by an amazing support system. My family members live close by and watch my kids during the day so I can be at work knowing that they are in good hands and getting quality family time. Also, my family and friends help out by encouraging me, making me laugh, working out with me, or giving me a safe to talk. It definitely takes a village and I feel blessed by the love that surrounds me. It is an honor to work and learn with Mrs. Tabaka. Our community is that much better because she is a part of the Carpenter Family!